A national bookstore chain have cancelled a reading of obscene and blasphemous poetry due to happen tonight after a 24-hour campaign by a Christian prayer and lobby group. Waterstones were due to host Patrick Jones' poetry reading in their Cardiff store tonight, but less than 24 hours after Christian Voice members began contacting the store and Waterstones' top brass, the event has been pulled. 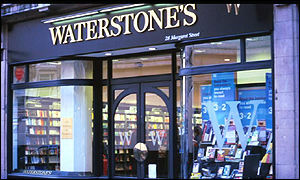 The store say it was down to 'unforeseen circumstances' but Kirsty Hardy , PA to Waterstone's MD Gerry Johnson, was more honest: 'It is not appropriate for our stores to host events that are potentially disruptive', she told Christian Voice. Members of the group were planning to attend the event. 'This is a triumph for the Lord, not for us. The Lord had not even showed me what we should do at Waterstones, only that it should be Christlike. 'Nor was I even praying for the event be cancelled. But I now know many were, and their prayers have been answered, by a mighty God. We have not even had to go down to the battleground, let alone fight (2Chr 20:17). Just the knowledge that we were on our way has put the fear of God into the opposition. 'However, Waterstones are still selling Jones' book "Darkness is Where the Stars Are" which is full of anti-Christian rhetoric and profanity. The poems, some of which Patrick Jones sent me yesterday morning in an act of hubris, aren't actually much good, but they possibly have enough profanity and references to female genitalia to get the literati excited. One of them included the blasphemous if not terribly original line: 'just like mary magdelene (sic), i f****d jesus'. 'Waterstones have said they do not 'act as a censor' although plainly they do have editorial discretion. I now call on them to remove Jones' book from their stores and their website. In August, protests in Cardiff by Christian Voice outside Hugh James solicitors and at the South Wales Echo led to the Echo apologising for a blasphemous article by Dan O'Neill. Stephen Green concluded: 'Even after the abolition of the law against blasphemy, companies need to think twice before insulting Jesus Christ. Click here to see the text of the leaflet our members are handing out at Waterstone's stores around the UK - and beyond!